Lily, I wanted to express my appreciation for the whole process in dealing with your company before and during our recent trip to Costa Rica. My wife, Debbie Pfohl, booked a holiday in Costa Rica for our family through you. We arrived home the other day after enjoying an incredible trip. Each stop that you scheduled for us was perfect for the interests of our family. We are so thankful to have booked a trip through you! I wanted to thank you one last time. We had the best trip ever!!! Travel Excellence really delivered! Everything was exactly as promised. The hotels were amazing, the drivers were on time and so nice, the tours were adrenaline filled but safe. I don’t have a single complaint or regret. American travel agency’s could learn something from Travel Excellence! Lastly, I can’t say enough about the beauty of your country, but even more impressive to me was the people. I was blown away by the overall kindness. Not just at our fancy resorts but everywhere. You should be really proud! My family and I would like to thank you for one of the best family holidays we’ve ever taken. We still talk about it often and can’t wait to visit Costa Rica again. I would also like to thank you for the absolute great service we received from you & the company in regard to the bedbugs situation in the last portion of our trip. On the last excursion we took from the Papagayo we passed by a coffee producer on the way back to the hotel. We bought some coffee there, and cannot get it out of our minds. We are opening a Juice & Coffee bar soon and we would love to serve the Costa Rican Coffee we had last year. Our family had a wonderful stay in Costa Rica last February! Thank you for all you did to make the trip so amazing. I am passing your name along to a few friends (as well as a few of my patients) if that’s ok? Just catching up on e-mails following the holiday. I was going to e-mail you anyway to compliment you and your colleagues in organising an excellent holiday for us. The transfers were well on time and were seamless. The whole experience was perfect. We shall certainly recommend your company. We hope to re-visit Costa Rica in two or three years and shall instruct your company again once dates and times are known. Thank you so much for putting together such a fabulous trip to Costa Rica. Everyone was so friendly and very helpful....Pura Vida. Just want to thank you for a wonderful holiday vacation. We’ve been very busy since getting back, but I finally found a few minutes to drop you a note. Sure appreciate your time and efforts to help plan our vacation. Everything went very smoothly. We’ll be sure to drop your name whenever our friends indicate interest in travelling to Costa Rica. Just a quick note to say we all think Kattia is great, and very efficient. She always acknowledges our requests, comes back to us super quickly, and has spent the past few weeks sorting out one of Esther’s bookings for Christmas, which is now finally over! So please thank her on our behalf. Lynne and I thank you and Travel Excellence for organizing a most wonderful tour for us!!! We returned from San Jose last week and are already longing to go back to the sunshine, the landscape, the animals and the great people we encountered during our three-week visit to your country. We arrived home energized by the incredibly rich and numerous experiences afforded by our Travel Excellence tour. We have been recommending Costa Rica and Travel Excellence to our family and friends as we regale them with stories, photos and videos of our trip. We believe the tourism industry in Costa Rica is one of the best we have encountered on our many travels. Countries wishing to improve their tourism services (including Canada) would do well to study closely how you do it. We, 5 middle-aged adults, recently returned from Costa Rica (Jan-feb 2018). Cindy from Travel Excellence arranged our whole trip. It was excellent. We were in Costa Rica for 18 nights. We stayed in 6 different exceptional hotels and had 7+ different transports and a couple excursions all arranged by the patience of Cindy. Initially, I booked our trip on Expedia and Booking.com but when Travel Excellence agreed to arrange a comparable trip and stay almost within our budget, we decided to hand over our trip to their capable hands. Cindy worked hard to match our plans/budget. She also made some helpful (and cost saving) suggestions (i.e. stay at this hotel because they have free shuttle to airport) that we did not know because we have never been to Costa Rica. She helped us decide our excursions and told us which ones to book ahead and which ones could wait until we arrived. She arranged all our transportation and they were always on time. When we got off the plane in San Jose on our first day, there was a lady from Travel Excellence there to greet us and after that, I relaxed and everything went smoothly. Every transaction was very professional, honest, attentive, responsible and reasonable. I will recommend your company to our many friends and family that now want to visit Costa Rica after seeing our incredible pictures and hearing our stories. I will return to Costa Rica ...I absolutely loved it. It was a trip of a lifetime....THANK YOU so much. Thank you so much for arranging our wonderful holiday. The attention to detail was excellent. You listened to our requirements and set up really great locations and guided trips. We are truly grateful to you at Travel Excellence for helping to create such super memories. When asked at hotels and by guides who organised our trip, they all agreed that T. Ex. Always sorts things well. Well done and thanks again. We are now at the airport waiting for our return flight home. We have had a marvellous holiday and we have been extremely impressed with our drivers (always on time) and the hotels we have stayed in. Thank you so much for arranging it all and we shall certainly let our friends know how good Travel Excellence is. Now that we can fly direct from London to Costa Rica, I am certain more English people will wish to come here. If you have any satisfaction form, I would be happy to filled it in and recommend you. With all the holiday craziness, getting settled back home and back in time and having family from the US visit a few days after our arrival, this thank you is coming late but still most heartfelt. THANK YOU for all the work you put into it!! We had the most wonderful trip. Everything was really smooth and the accommodations where super. We could just drop off the key at the drop box of the hotel in San Jose, which was so great. I attached a pic of us, so that you know who you dealt with. Mike and I had a wonderful time in Costa Rica. All of the activities were fantastic. Our favourite day was the adventure day at Hacienda Guachipelin. We will have many great memories. One update for you, the Rio Celeste hiking, no longer allows you to swim in the park. The information in the package said we should bring bathing suits and towel, this is no longer the case. Thank you so much for your help with planning. I will recommend Travel Excellence to anyone I know going to Costa Rica in the future. Here are some random thoughts and observations about our trip. I was disappointed that we couldn’t see the Poas volcano, but no one could control that! Some of us would say the River Flat Trip was a favorite part of the trip. We especially enjoyed when one of the naturalists found a poisonous dart frog for us to see. It was very relaxing, plus it was fun to eat the snack at the farm. The plantains were quite good there. Unfortunately we didn’t see a quetzal at the Monteverde Biological Reserve. The Selvatura Park zip line was fabulous. It was very foggy and misty the day we were there, but it was still fun. We all especially enjoyed the Tarzan swing at the end. We didn’t have much time to walk on the hanging bridges and it was raining quite a bit then, but we still enjoyed it. The Don Juan tour was very interesting and informative. Our guide was quite good and related well to the kids. We enjoyed all the hotels: Apartotel Villas Del Rio, Arenal Paraiso, the Monteverde Cloud Forest Hotel, and Tamarindo Diria. It was nice to be at a hotel for more than one night. The restaurant at the Cloud Forest was the best—they were proud that they used a lot of locally sourced foods. Also, do you know there is a Stucki Restaurant in Monteverde? We didn’t actually see it, but the hotel staff told us about it. One of the grandsons said one of his favorite parts was the hot springs at Arenal Paraiso. All of the guides were quite knowledgeable and friendly and helpful. The trip was well organized with a right balance of planned activity and free time. I think many of us were in bed by 8:00 each evening! Being at a resort on the ocean was a good way to end the trip. So, thanks again for your help. We thoroughly enjoyed our time in Costa Rica. We are highly recommending such a trip to anyone who asks. And we’ll recommend you to anyone who might want specific information. It is windy and cold in Ohio today. I just remember the warm sun on my body at the beach! Realmente tuvimos un viaje estupendo, tu país es maravilloso pero aun mejor las atenciones que recibimos por parte de toda la gente. Carlos and I had an incredibly amazing time in Costa Rica. Even though we visited in the high rain season, each day was eventful and lively. The accommodations were spectacular and activities were breathtaking. We constantly talk about our travels to the beautiful country. We’re looking forward to next year’s vacation are starting to create ideas. Does Travel Excellence service other countries? We are very active and curious and look forward to exploring a new part of the world. Thanks again for all your help. Travel Excellence has set the standard for our travel needs. Thanks for the below email, we didn’t pick it up at the time but there was no real issue getting to the Windham in the end as the hotel paid for the taxi we got which was very good of them. The info and vouchers we received upon arrival were incredibly thorough and useful. If the had included details on the above transfer back to the Windham they would have been faultless. Kayleigh and I both got vey unwell after drinking the tap water at the Mountain Paridise Hotel, despite the hotel having signs that this water is drinkable. Whilst we accept this is our own responsibility, please ensure that this issue is communicated to all future travellers with "travel excellence" very clearly as we don’t want other people to ruin 48 hours of their holiday as we did. Casa Corcavado is the most amazing place we have ever been and I would recommend you build this into more of your future itineries for your customers who don’t mind sleeping without aircon etc and are in the country for a proper adventure holiday with a bit more seclusion. Thanks again for your professionalism and attentiveness and for putting together a great holiday! Ciao Cindy ritornati in Italia da meno di una settimana ed il Costa Rica già ci manca! Siamo stati benissimo e voglio ringraziarti per la splendida organizzazione. Complimenti a te alla tua azienda e al personale tutto. Se vieni a Roma conta su di noi. It was with much sadness that we finally had to leave Costa Rica earlier this week and return home to England. I can honestly say that my entire family fell in love with your beautiful country, the fabulous wildlife and the friendly people. We have come home with very happy memories of a very special holiday. I would therefore like to say a big “Thank you” to everyone at Travel Excellence who were involved in putting the itinerary together for our 2 week tour, and especially to you for all of your help whilst we were on tour in answering questions and making changes and amendments. It was very comforting to know that we had someone on hand who was able to help us when it was needed! I was very impressed with the organisation of our tour which was executed flawlessly – everything took place on time with no problems, all the drivers were very friendly and helpful etc. I shall have no hesitation in recommending Travel Excellence to friends who may be thinking of a similar holiday to Costa Rica in the future. All went well with the services you arranged for us. At the Laguna Lodge we had Carlos and Martha as guides: they have great knowledge of Costa Rica, animales and nature and are well organised. At Fortuna, the tour with Ecoterra was also very good: well organised, good guides with great knowledge. I would like to take a moment to once again commend the entire team at Travel Excellence for a job very well done. Visiting a country for the first time with a very important client and providing the client with a successful incentive program is no easy task, however, partnering with Travel Excellence on the execution of all logistics for the program proved to be essential and was the driving force behind its success. From first contact at our site visit my client and I were equally impressed with the knowledge and pleasant yet professional approach that was taken. Throughout the planning process our willingness to revise ideas and plans was priceless and we are very thankful for your creativity and recommendations on every level. Transportation, tours, theme parties, staffing - all was superb and all competitively priced. (Although I would doubt any other company would have the strength of your fabulous staff to back them up). I have to say that from the drivers of the tour buses through to the hospitality staff and logistical staff - everyone was helpful, courteous and went out of their way to insure our attendees were tended to and happy. My clients and I were thankful that we partnered and truly believe we owe most of the success to Travel Excellence and their wonderful team. I only wish we could take everyone with us wherever we go because it's not often the case to achieve 100% satisfaction and experience such wonderful, warm and friendly staff. I hope to bring more clients to Costa Rica and will absolutely contact Travel Excellence when I do! They're life savers and a team you want with you every step of the way. I would highly recommend them and their services. We had the best time. Everything was perfect. Whenever we had a problem, you solved it. I highly recommend Travel Excellence! Thank you for everything! For the months leading up to our vacation I had endless questions and changes and you always responded back to me quickly. Everything was booked perfectly and we had NO problems or issues. Even when I decided to change something at the last minute you were free for me and so was the company (and it was way after hours). I think the thing that impressed me the most was when you flew in to Liberia Airport to meet me when we got off the plane from LA and to personally hand me all of our tour and hotel information. Honestly that was the best, the entire family was impressed. Everything from the kind of hotel rooms I wanted down to the rental cars I asked for was done to my exact specifications. The tour company's that you chose for our excursions were also top notch. In the future I will recommend you and your company to any of my family or friends traveling to Costa Rica, you made everything so much easier for me and because of that we had an amazing vacation. Cindy, thank you again for everything. The trip is organized almost seamlessly. The stay at hotels are super! (except that Cloud Forest Lodge has no internet connection in rooms. I have to move my computer to the lobby to check emails. I was told that they were fixing the internet switches, but not fixed during our stay). Both guides and drivers are knowledgeable and polite, and they showed up timely. Services are 5-star, esp. at Parador Resort. Costa Rica is a beautiful country covered with pristine rain forest that had brought us endless surprises. For the first time, we had seen sloths, toucans and other exotic animals (reptiles, insects, ....) We had also did extra tours such as canopy tour at Montverde and charted fishing at Manuel Antonia, both left us lasting memories. Kevin and his mother had enjoyed his ATV ride. The most importantly, people are very helpful, polite and honest. We will definitely go back. My wife and I are even thinking to buy a vacation house there! Thank you so much for your help that has alleviated lots of our anxieties. Your did so much extra to accommodate our numerous changes during first two days when the situation was so dynamic. Both families are grateful. Penny and I cannot say it enough! We have thoroughly enjoyed working with your entire team and feel that this program's success was hugely due to our partnership with Travel Excellence. We would truly like to acknowledge all of your team who have contributed to the success of our program! Back to work, boo! But I wanted to give you an overview of our trip! The organization of our trip to Costa Rica couldn’t have been better planned! You did an amazing job and making this a worry-free trip for us. I know we weren’t the easiest of clients but any fears we had before leaving for Costa Rica vanished once we arrived. Our first driver explained all the vouchers and we could tell all the plans had been well thought out. He also spoke perfect English and we learned a lot about Costa Rica, its government, its history, weather, etc. The Park Hotel was clean and nice, and actually had the best food of the entire trip! The highlight of the trip was definitely staying at the Springs Resort and Spa in Arenal. I know that was a change from the original plans, but we’re so glad we made that change. The accommodations were outstanding. The hot springs were amazing (including the fun waterslide between the springs), the grounds were gorgeous, and the Club Rio they had on the property was beyond compare. We went horseback riding the first night and the horses were so lively and fun to ride. We also toured their sanctuary and the animals were outgoing and interactive. We didn’t have time to white water raft so we definitely want to do that the next time we go back (and we plan on having you help us book our next trip)! The EcoGlide company you found for our family so we could all go ziplining was the BEST! The views were awesome and the lines were very long and high! Awesome experience, and very well organized. I was probably most nervous about taking the small plane to Manuel Antonio but it worked out well. We arrived safely and avoided a whole day of travel. Overall, I’m glad we saw two areas of Costa Rica. I think I might have switched the trip to do Manuel Antonio first, then Arenal last, only because the Springs was our favorite part. But the tour through the rainforest was so great. I thought at first it might be kind of a boring excursion but it definitely wasn’t. We loved seeing all the wild monkeys, sloths, deer, crabs, butterflies, macaws and toucans. The time at the beach at the end was the only time we made it to the ocean so we’re glad it was part of the tour. The water was warm and beautiful. The Parador Resort was well maintained and clean, and it had great views. My only negative feedback was that its pools were not great for kids. It had two pools for families, both side by side, and both of them were really deep. Over 5 ft deep for both. I felt like I couldn’t take my eyes off of them while they were swimming because they were having to cling to the sides of the pools. It also didn’t have any water slides or pool features kids would like. Luckily we noticed the Zip Coaster down the road and took a taxi there, and that was a huge highlight of the trip! The boys went three times, they were having so much fun. We did arrive at the San Jose airport pretty early. The drive from Manuel Antonio only took about 2 hrs 45 minutes. We waited for 3.5 hours to board the plane. But I guess it’s better to be safe than sorry. Overall, 5 star vacation! Thank you so much for coordinating it. We can’t wait to bring our whole family next time! Cindy muchas gracias por todo, la pasamos muy bien, fue muy buena decisión usar de sus servicios y aprovechamos muy bien los días que estuvimos aca en Cosa Rica. Your company services have been excellent and very professional. It has made a positive difference to the enjoyment of our holiday having reliable transportation services. I will be pleased to recommend you services to the travel agent I booked through so she can feel confident with continuing to engage Travel Excellence for her clients. I want to thank you so much for all your help with our Costa Rica vacation - we had a blast!! But other than that we loved the trip and can't wait to go back to Costa Rica. Overall great trip! Thank you so much for helping us and spending time editing our itinerary. We enjoyed the hike to Rio Celeste, Jaco beach, the caves, zip lining, canyonering, and the night hike. All of the transfer drivers were on time and got us where we needed to be without problems. The hotel accommodations were excellent. The hike to arenal was boring and I would not recommend it. The day hike in the cloud forest was also a bit mundane. Hotel Pariaso was beautiful but too far from downtown for us (cab ride was cheap but we would have preferred to be within walking distance). Thanks again for all your help and I would recommend you and your company to any of my friends! Just a quick word of thanks on behalf of Sylvie & I for our recent trip. Your organisation was outstanding, sending us to places we could have only dreamt of and giving us experiences we will never forget. Travel Excellence was truly excellent, and you are a great ambassador for the company. The service we received from Travel Excellence was first class. They organised hotels with excellent facilities, courteous staff and opportunities to see and enjoy the gardens, birds and animals of your wonderful country. The drivers of the private cars we used were also friendly, informative, courteous and very efficient. Altogether it was a memorable and very enjoyable holiday. Noi appena tornati da un altro viaggio fantastico, tutto è stato perfetto e volevamo ringraziarti per il tuo lavoro. Hola Cindy la bella! Nos disfrutamos muchisimo Costa Rica. Que lindo tu pais. Y la gente es muy amable. Fue increible que todo fue exactamente como lo planeamos. Todos los transfers fueron perfectos, y todos los excursiones fueron muy divertidos y los guias fueron buenisimos. El Tabacon es increible, y el Parador tambien. Nos gusto a todo. Tengo algunos companeros ya quieren visitar a Costa Rica. Les he dado tu informacion para que puedas ayudarles. Y nosotros queremos volver pronto. Gracias, gracias por todo. Eres la mejor!! Thank you very much for organizing our trip at such short notice, we had an absolute fantastic time, everything was perfect. Thank you so much. Il nostro viaggio in Costa Rica e' stato fantastico! I panorami, il mare, la foresta, gli animali, le persone, il cibo...veramente indimenticabili. Grazie per averci aiutato a realizzare tutto questo con i tuoi consigli, la scelta degli alberghi e delle escursioni. Il tuo aiuto e' stato insostituibile. quando hanno portato la macchina al garage dell'Alamo gliela hanno sostituita con un'altra perché hanno detto che tutte le gomme erano malridotte. Questo ovviamente non è' dipeso da te ma volevamo fartelo presente. Per il resto ci siamo trovati benissimo. È sicuramente un viaggio che consiglieremo a nostri amici facendo il tuo nome è quello di Travel Excellence. De nuevo muchísimas gracias y... ¡PURA VIDA! Hi Cindy, many thanks for arranging an excellent trip. Everything went really well. I have arranged an hotel shuttle to the airport for early tomorrow morning. My group changed their mind about sailing today. Thank you for looking up information about that, and thank you very much for all what you did to put everything together and to plan for the whole trip. It is very well organized and as we expected. You have an amazing country and very nice people. My family and I want to thank you for your time and support in making the arrangements for our trip. Every moment of our trip was so special. Our son who is 20 and daughter who is 18 both agreed that this was the best vacation we have ever taken as a family. We cannot express enough how the team at Evergreen exceeded all of our expectations during our stay in Tortuguero. Our guide, Eddy, was such a gracious host making sure that our departure went smoothly. He arranged an early lunch for us before we departed that was incredible and then stayed with us until our flight departed. The meals and the atmosphere at Evergreen was perfect. The staff was so accommodating to all of our needs. Our son who is an avid fisherman wanted to fish. A staff member at the reception desk provided our son with his personal fish line and told him where the best fishing was. We're sad but not upset that my cold kept us from the horseback ride to the waterfall at La Fortuna. Before we left for Playa Grande, we hiked down to see the waterfall. Beautiful. Our children were also fortunate to be able to join a whitewater rafting tour thirty minutes before it departed. This was a very special trip for us. Thank you again for your time in making the arrangements and answering our questions. The fact that you came to see us and brought a gift when we arrived in San Jose exceeded all of our expectations. We're wishing you all the best this holiday season and into the new year. Hope your doing great! I wanted to tell you what a wonderful time we had in Costa Rica!!! When you get a chance give me a call please. Thank you for all your hard work and patience with us especially me. Just a message to thank you for rearranging our holiday when the osa peninsular was flooded and hurricane Otto arrived. Rancho Naturalista treated us exceptionally well, giving us warm welcome and arranging excellent bird tours. Lisa ensured that my wife's food allergy was well accommodated and the guides Harry and Luis were exceptionally good. They turned disaster to success! Many thanks! We have been back over a week now and just coming around to the idea that we are no longer in Costa Rica ! Just wanted to say thank you for covering everything during the trip, it was an unforgettable experience. Finally thank you for “Costa Rica from Above”, it is giving us ideas for our next trip. La hemos pasado de lo mejor. Espero volver a contactarla y que fuera pronto. Todo estuvo mejor de lo esperado. Tenga por seguro que los recomendaré con todos mis amigos cuando viajen a Costa Rica. Just a note to say sincere thanks for your help on the trip. It worked out great. San jose was good, hotel great, transport in general v good, monteverde was terrific, and playa hermosa was super. You have a lovely country,nice people, a great future, and I hope we can make it back. So , cindy, many many thanks for your time and effort. We are at the airport waiting for takeoff. I just want to thank you for all your help and detailed attention to every part of the trip. Everything was so well taken care of and extremely enjoyable. It was a fantastic trip and I and confident that we will be visiting again! Thank you so much for all of your help. Matthew and I had an amazing time in Costa Rica. You have a beautiful country and even more beautiful people. Every excursion was perfect. It was a trip we will never forget. In fact, we are already discussing when we can return--and get to see Rincon de la Vieja. When we do, we will contact you to help us make sure we see other spectacular areas of CR. All the best and Pura Vida! Thanks so much for your help with everything. And I appreciate the two free meals! Overall everything went smoothly and all the attractions where great. When I come back to Costa Rica, I'll be sure to get in touch again. Mil gracias por todo, fue una experiencia formidable, cada detalle fue perfecto, los tours, los lugares, los guias y la gente, nos vamos enamoradas de este hermoso país! !!! We recently spent a two week vacation in Costa Rica and used the services of Travel Excellence for transport and transfers between various locations. May we take this opportunity to say thank you for providing such an excellent service. All arrangements were organised very professionally and the itinerary was very easy to follow. This contributed greatly towards our vacation enjoyment. All drivers were prompt, courteous and ensured that each journey we made was as comfortable and interesting as possible. Could you please pass on our thanks to Hilda, for organising our transfers, and to your drivers whom we had the pleasure of travelling with. We have all been having such a fantastic holiday! Thank you so much for all the amazing hotel rooms and great activities you organised for us. It has been a wonderful family holiday, and I am very grateful. We are now relaxing in style at the Andaz. I will be happy to give you lots of positive feedback when we get home - all the guides and drivers have been so nice and knowledgeable and helpful. What a great experience! I am so sorry about the late notice! I just wanted to take a second to thank you for the amazing trip I had through you guys a few weeks ago. The entire trip was flawless! We had the best time ever and really appreciate the effort you guys made to make our trip one of the best we’ve ever had. The hotels were amazing as was the transfers to and from the airports and the ease of getting and dropping off the rental car was great as well! Next time we come to Costa Rica we will definitely reach out to see if you guys can assist in the trip planning! Thank you so much for organising such a great trip. We absolutely love your country and sincerely hope to come back again in the future. I would like to thank Kathya Calderon at Travel Excellence for her friendly and professional service during my recent trip to Costa Rica with my daughter. During the first couple of days we decided that rather than maintain our original itinerary we would hire a car and do some independent travelling. This involved cancellation or rescheduling of hotels, transportation, booked activities and an internal flight, all at very late notice. Despite this Kathya was most accommodating and when it came to reinstating some of the accommodation and activities she was again there to help. Even after the trip, when paid for rafting photo's hadn't arrived, Kathya was able to rectify the situation. As a director of an insurance industry organisation in London I know how important it is to provide good customer service. My experience of Travel Excellence was that the service was more than good... it was excellent! Congratulations on running such a professional business. Cindy, hola, buenos días, es un correo rapidito para agradecerte la atención y el itinerario y que hayas estado al pendiente, el viaje estuvo muy padre, nos la pasamos super suave y en si los hoteles, tours, traslados y todo estuvo muy bien. De nuevo muchísimas gracias por todo, tienen un país hermoso. Hi to all of you at Travel Excellence! I just wanted to say another HUGE thank you to all of you for the most amazing trip to Costa Rica. It’s been on my wishlist for years and it certainly didn’t disappoint! My journalists loved it too – I picked a few real wildlife enthusiasts and everyone went home happy after some excellent viewings. I discovered that all the best nature spots happened right at the last minute for me. Just when you think it’s time to give up finding a particular animal or getting a good photograph, that’s when they’ll turn up. I managed to get some good sightings of crocodiles, scarlet macaws, sloths and squirrel monkeys right at the last minute – and we even had a small pod of dolphins keeping us company on the boat journey back from Osa. Thanks Guido for putting together a perfect programme for the journalists – they’ve all emailed me to say how much they enjoyed the trip and it was the perfect balance of activities and down-time. Thanks Marco for engineering my extension to Casa Corcovado – this was a real highlight for me and I can only imagine just how many boat trips it took to get all the building materials there to build it in the first place! Thank you CARLOS for having such a great team who are such a pleasure to work with – including Paulo who looked after us and Henry who was with John but guided me for a 200 metre stretch of the road outside the Parador Hotel and then joined us for lunch along with Hilda before we flew home. I’ve got a friend flying in to Costa Rica today with his young family – he emailed me last week to ask for some advice on what to do and how to organise everything with Rainbow Tours. I’ve got more friends coming out later in May so I’ll do the same with them! I’ll share the results from the trip with you in due course! Thank you for everything. Hotel is absolutely amazing. We just back from snorkeling tour. It was reschedule from yesterday. It was great. We are using small beach which is near hotel. Short walk and you in the paradise. The little bit rocky seafloor but it's OK for us. We still don't answer on the one question. Why we came to Costa Rica only now, why we didn't do it many years ago. We are leaving Parador tomorrow. I will try to send my clients to Costa Rica and will refer you. Thanks again and keep it touch. Now we are back in Sweden after a wonderful holiday in Costa Rica. I want to thank you so much for all your help. Hotels and all trips have been super and we enjoyed so much. Hi Cindy, thank you your email and good wishes. I would like to thank you most sincerely for organising such a wonderful itinerary. You assistance throughout has been of the most excellent standard of service. I would have no hesitation in recommending you and your company. Very best wishes to you. All transfers went exactly as planned. Drivers and cars were waiting for us and arrived on time, and most of the time they were early. The cars were clean and stocked with snacks, and the drivers were friendly and helpful. We had an absolutely amazing time in Costa Rica. It is a beautiful country, and we plan to return as soon as we can! Travel Excellence is a wonderful company, and we are so grateful for your help and the kindness of every guide we met along the way. Thanks for everything you did to make our Costa Rica trip truly AMAZING. The hotels were spectacular and each location so different from the last. The Travel Excellence drivers were very professional and friendly – we especially enjoyed Danny’s company on those long drives J. All the arrangements were perfect and we can’t thank you enough. I have posted a note on your Facebook page and also on mine – I have many travel agents who are my FB friends so hopefully this brings you some good leads for future bookings. I really want to go back again to CR before too long – and this time we will bring our son who is 20 and studying for a degree in Environmental Science. He would love Costa Rica especially Playa Nicuesa Rainforest Lodge. I’ll let you know when that is and hope Travel Excellence can help us with the arrangements. I had no idea Costa Rica was so beautiful and diverse. I feel there is so much potential to grow the number of US travelers to Costa Rica, all the people we met were so friendly and it’s really easy to travel there due to the time zones, currency, language and great air connectivity. I am so excited about the destination that I am even thinking about trying to find a new CR client to represent in the US! Thanks again, I will do my best to spread the word about Travel Excellence and Costa Rica. We recently visited Costa Rica on a press trip, organized by the ICT. One of your employees, Henry Porras, was assigned to us for the trip and he was simply outstanding in his service and amicability. It was the first time Henry dealt with journalists doing a dive feature and he was quick to understand the schedule of the divers and what we were trying to achieve for photography. I wish to commend Henry Porras and Travel Excellence for being such hospitable and reliable hosts and helping us to achieve our mission in the limited time we had. This feature on Costa Rica and the diving in the Gulf of Papagayo, would be published in the next few weeks and we would send copies through the ICT. In the meantime, you can have a look at some photos we have been posting on our FB page, from our visit to your lovely country. Feel free to "share" any of our photos on your own business page, to help us spread the word about Costa Rica's beautiful underwater world. Thank you for showing us what "travel excellence" is about and how appropriate a name it is for your company. Cindy and I arrived back in Denver early this morning, but just wanted to tell you what a wonderful time we had and how wonderfully Travel Excellence once again took care of us. Every little detail took place exactly on time, the accommodations and activities once again exceeded my expectations and I had high expectations from traveling with Travel Excellence previously! I can't thank you enough for all of your help and for the excellent itinerary. Cindy and I have fallen in love with your beautiful country and your countrymen and hope to get back on a regular basis and we wouldn't think of coming down without the expert guidance of you and your company. The Parador and the Paguare Lodge were just fabulous. If ever you need a recommendation for your company please don't hesitate to use my recommendation. I just spoke with my clients and I want to thank you so much. They loved it and everything worked out excellent. They really enjoyed the program you made for them. They were able to see so many places and do so many things. They liked the mix with adventure, nature, beach and sometimes even luxury in a Jacuzzi. I really would like to go to Costa Rica and find out for myself. I think I would be able to send even more clients to you then. Having just returned from a fantastic holiday in Costa Rica, thanks in part to the brilliant services offered by your company, I felt compelled to write and pass on my thanks to all involved. From the moment we arrived at San Jose, every single arrangement ran like clockwork – every transfer was comfortable and on time and every tour was extremely enjoyable. We must mention our guide Juan on our 3 day trip to Tortuguero. He was very personable and extremely knowledgeable, as well as having the patience of a saint (one member of our group was particularly difficult). We plan to return to Costa Rica to see more of your amazing country and will not hesitate to let your organisation arrange it for us. I have recently returned from the above tour and felt compelled to write to you to thank you for a wonderful holiday. My travel companion and I have travelled quite extensively, and indeed we have both toured Costa rice previously, but I can honestly say that this was one of the best holidays we have ever had. This was in no small part due to the excellent services of our wonderful guide Hector Calvo. He enhanced our holiday by his love and knowledge of your wonderful country, its flora and fauna, and we felt privileged as a group to travel together and share some memorable experiences. Everything ran like clockwork and nothing was too much trouble! Thanks also go to our driver Luis who was very much a part of the group and helped to spot lots of wildlife. We look forward to travelling to Costa Rica again before too long and will definitely be using your services and will recommend your company to others thinking of travelling to Costa Rica. Please pass on our sincere thanks for truly memorable holiday. We’re back in Switzerland since a bit more than 10 days and it’s time for us to say THANK YOU and give our comments. We spent 20 wonderful days in your beautiful country. We were in very good hands with Lars, our guide, and Orlando our driver. The car was very comfortable, Orlando drove safely, was always polite and in a good mood and the pick up time was always respected. Lars gave us lots of useful and interesting informations in many different fields (flora, fauna, geography, politics, etc.). His French was perfect and he was so kind to translate in English for my sister-in-low. We appreciated both of them so much. The trip as well as the hotels and lodges were very good. We enjoyed every single place very much. Accomodation, service, food and cleanness were perfect everywhere. The tours were well handled and we had also enough time for relaxing. Also the transfers from Tango Mar – Tambor to Corcovado via San Jose and Drake Bay and the way back from Corcovado to San Jose were excellent. Not once we were worried or disappointed. We felt we were in good hands and could relax and enjoy our holidays a maximum. Every good thing has an end. Work and school started again. We have plenty of pictures from Costa Rica that we have to sort and put in an album. More than pictures, we have plenty of good feelings and emotions which we’ll keep for long time in our heart. For us, and especially for our 13 years old son, Costa Rica was PURA VIDA !!! Graeme and I wanted to send an email to thank you so much for arranging such an amazing honeymoon for us in Costa Rica. We had a fantastic time and all the arrangements you had set up ran perfectly and all the drivers we had were friendly and professional. All the accommodation we stayed in was also fantastic and we had a lovely time experiencing different places. Costa Rica is a beautiful country and we had a truly amazing time. The Pacuare Lodge in particular was a completely unique experience and we loved it. We also really appreciated you calling us and checking everything was ok. Thank you so much for everything and we would love to come back to Costa Rica one day! We thought we must get in touch to say a huge thank you for all the arrangements for our trip to Costa Rica, which exceeded our expectations in every way! Travel Excellence certainly lived up to their name, with their efficiency, their helpfulness and the drivers who acted as very good ambassadors for their country. The time spent in long drives with them became a very big part of our enjoyment as we were able to chat with them and find out so much about the country and its way of life (something we wouldn't have had the opportunity for in a big group). We found the hospitality in each of the lodges very welcoming, some standing out even more than others. Thank you again - we shall certainly recommend Costa Rica and Veloso Tours. Below is a copy of an email I have just sent on returning from your wonderful country. Dear Sir/Madam, we have just returned from this excellent tour and wanted to say how much we enjoyed the country. Our Tour Director and Guide, Alex Castro was exceptional. He was ably assisted by our driver Luis and nothing was too much trouble for either of them. Alex was very knowledgeable on all aspects of Costa Rica, it's people, history and especially bird and wildlife - he really made the country come alive to our group. His ability to spot and identify birds and animals ensured that we saw many species - around 130 in all. Our driver Luis also proved to be a good 'spotter' as well as driver and they made a good team. In Tortuguero, Alex had requested the services of Marvin at Pachira Lodge and their combined expertise was a revelation to the whole party. Alex and Luis are wonderful ambassadors for both Costa Rica and Travel Excellence and also, by association, Archers. We shall recommend this holiday to our friends. We have just returned from Costa Rica having spent three weeks organised by you for us in conjunction with Trailfinders. I just wanted to thank you for your excellent service. Apart from the one taxi driver that I have already spoken to you about and which wasn’t your fault the whole holiday was a complete success. All hotels were excellent,all transfers and transport were carried out smoothly,all tours and trips were very enjoyable and all contacts were friendly and helpful. Lindsay Padilla C., La Fortuna de San Carlos, Alajuela, Costa Rica. No nos cabe duda de la calidad de personal de Travel Excellence y les agradecemos por todo el apoyo brindado a la comunidad de San Rafael de Peñas Blancas. Hoy los niños no tuvieron lecciones debido a un evento de la regional, sin embargo la escuela estaba llena, como cualquier otro dia lectivo. Los niños compartieron mucho con sus visitantes. Hay una niña de segundo grado que tiene problemas (algo muy similar al autismo) e involucrarla en las actividades diarias de la escuela es casi imposible. Ella requiere ser atendida individualmente y justamente mi hermana es quien se encarga voluntariamente de ayudarle dos veces a la semana. La primera ves del año, cuando Alex Castro vino, ella no dijo una palabra, pero la vimos acercarse a la sala de eventos. Hoy en la mañana cuando les comentaba a las compañeras que Alex vendria de guia, la niña fue a su casa a alistarse y se decidio a bailar muy sonriente, nos dijo que estaba feliz en la actividad y se le notaba!!!. Nunca antes habia bailado y lo hizo muy bien. Ella se trajo al hermanito y lo puso de acompañante de baile. Eso fue un gran logro! Por supuesto sabemos que todos los guias de su empresa son excepcionales, pero que lindo hoy resaltar nuestro agradecimiento hacia Alex, por mostrarse tan abierto a vivir la actividad cultural de la misma manera que la viven los niños nuestros. Se le nota que disfruta lo que hace. Una maestra dijo que si la sicopedagoga la hubiera visto, no podria creerlo!!! Cosas que pasan, aveces un lindo gesto hace una gran diferencia y nos queda claro que interactuar permite a los niños de la escuela San Rafael ser niños diferentes, con una perspectiva muy amplia. Tuve la oportunidad de manifestarle a Alex lo acontecido y quise enviarles este mensaje de agradecimiento, por hacer posible tantas cosas buenas por aqui. Just a note to let you know we all had a brilliant time on this trip and everthing went to plan apart from seeing some of the birds that we wanted but that always gives me a good excuse for visiting again. I have now come down to earth and getting over jetlag and adjusting to the cold temperatures back in the UK and starting to sort through all the amazing photos that I was able to take. Thanks for all your hard work putting this trip together for me. I would also like to say that Hector our guide and Mario our driver were excellent as were all the Hotels/Lodges that we stayed including all food - BRILLIANT. I will get in touch with you when I intend visiting next. Thank you very much for great travel experience with your travel agency. The trip was excellent (so yours name brand name is true J). Everything was perfect. We are in love with Costa Rica. Btw, Merry Christmas and Happy New Year. Trip was excellent. Hotels were from good to excellent. Transfers were extremely well handled with all collections extremely punctual and the drivers were so courteous and well informed. Tours were excellent and all guides were extremely knowledgeable, friendly and courteous. Tour guides were amazing, they showed good knowledge of country, flora and fauna and showed their love of CR. All drivers were professional and were quick to point out sites of interest, wildlife etc. I cannot fault the trip and we would readily use you again and recommend you to others. Top marks. We loved Costa Rica and can't wait to come back. I had a great trip! Thank you for setting everything up. It rained a lot, but I knew that might happen when I decided to go to the Caribbean side in November. It didn't stop me from taking a great hike in Cahuita (where we saw lots of animals) or from enjoying Tortuguero. I live in Los Angeles where it never rains and the weather is always good, so it doesn't bother me if the weather isn't perfect when I go on vacation. Tamarindo was hot and dry and beach was fantastic. The day trip from there to Granada, Nicaragua was very interesting. In Tamarindo, the Hotel Diria was very nice (being right on the beach was fantastic), but they are doing some construction on the hotel right now. You might want to ask when they will be finished for your future guests. All of the transfer drivers were good, but Henry was excellent. He drove me to Tamarindo and taught me a lot along the way. Queria agradecerte todas tus gestiones, comentarte que el viaje ha sido una auténtica maravilla, todo salió a la perfección, no tuvimos problemas con nada, ni con el coche, ni carreteras, ni la gente .... un viaje redondo, perfecto!!! Ya le he dado las gracias a Bea Rayo por el gran regalo de boda, el raffting por Rio Celeste fue estupendo y nos los pasamos super bien, los guias son la bomba, si pudieses mandar un abrazo a Manuel, Gigi y todo el equipo seria estupendo.El Canopy y los puentes colgantes muy divertidos, las tirolinas son brutales y el trato recibido inmejorable. No se cuanto podremos volver a Costa Rica, pero nos llevamos un gran recuerdo de toda la gente, relamente sois todos PURA VIDA!!! Espero poder contactar contigo en otra ocasión, si algun cliente o amigo quiere ir a Costa Rica seguro que lo haré! Espero que todo te vaya genial !! Recibe un fuerte abrazo y PURA VIDA!!! Bueno yo todavía paseando e inspeccionando tu bello país, hoy regresada de Mawamba, desove de tortugas y lluvia mediante, el destino fue mejor aún que mis expectativas. Recién llegada a San José, salí a caminar con la idea de pasar por la oficina, pero el tiempo pasó tan rápido que al mirar el reloj ya eran las 19.30 hs ! !, mañana parto para Manuel Antonio, de acuerdo a como vaya todo, veré de hacerme un tiempo y saludarte al regreso. Puntualmente y lo que al Fam concierne quiero agradecer la calidez y la calidad del mismo, aunque confieso que con respecto a los servicios, parte de los mismos, antes que yo, los experimentó mi pasajero, de quien oportunamente le hice llegar mi satisfacción a Carlos Quesada, así es que doblemente satisfecha. We have just returned from our wonderful honeymoon in Costa Rica. We did not get a chance to complete the customer comments slip before we left so I hope you are happy that we are sending our feedback via email! In general our trip was excellent. We loved Costa Rica as a destination for our honeymoon. It was great to see four regions within the country and we loved the passion and knowledge of the guides who showed us the wide ranging flora and fauna. All hotels were excellent. Our favourite was probably El Remanso in Osa ... the location was stunning and the food excellent. We were made to feel so welcome. They also gave us a lovely meal with a bottle of wine on our last night in honour of it being our honeymoon. Grano de Oro in san Jose was very comfortable ... we were only there for a few hours as we had an early start. They were very welcoming also at Aninga lodge in Tortuguero. We appreciated the special cocktail served in a decorated pineapple for our honeymoon. Great to have all meals included. Great tours included. Arenal Springs was very well appointed. Comfortable room and great facilities ... shame it was not near enough to a range of restaurants to choose from. The Trapp Family Lodge was also a little remote. Room very nice. Transfers excellent. All very Smooth. Perfectly on time ... if not ahead of time. All drivers were very helpful and kind. It was great that they often spotted wildlife that we passed. We enjoyed all of our tours. It was a bit strange that there was quite a high transfer fee for the bird watching in Osa as it was only a few km down the road and definitely a part of the tour rather than to get to the tour. All the tour guides were excellent. They were so knowledgeable and passionate about all that we saw. We learnt so much and they clearly wanted us to have a great trip with many memories. We saw such wonderful things. Many thanks for your services ... we had a very happy honeymoon. Just to let you know about this wonderful feedback from clients. Please forward this email to all the staff involved. Just wanted to email to say a HUGE thank you for your organisation of our trip. We had an absolutely incredible time and all the tours, accommodation and all round trip were organised phenomenally well. Your itenary was excellent and we felt that we got excellent value for money, especially after speaking to other travelers. We also would like to strongly commend the ground team as we felt we were being looked after at all times. And Parador was indeed fantastic!! We will both (and I have already) be recommending your services to our friends and colleagues. 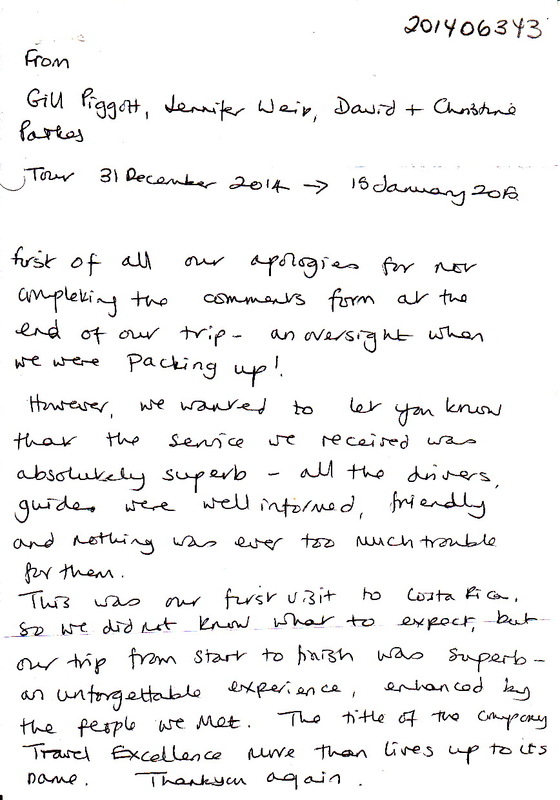 Thanks once again, and we look forward to booking with you again soon. My client came in this morning to show me pictures of her trip. She took about 500 pictures of her holiday; the pictures were great. Costa Rica is a beautiful country; nature is everywhere. We saw pictures of the ocean and the beach, the volcanoes, trees, flowers, animals, birds insects. It was great. My client was extremely happy with the accommodations; she did not expect something so nice. The services provided by Travel Excellence were indeed excellent. She said she would recommend your company to anyone and Costa Rica as a place to visit. She would go back in a heartbeat. She thanks you for everything. My congratulations on the superior service your company provided my family on our recent trip. All of your people were punctual, very friendly and delightful. However, there is one guy I wish to single out...Henry..his charm, knowledge and enthusiasm for his job and his country was infectious. His assistance and guidance was a large part of making our trip a success. Just got back to the office, and so sad that our most amazing trip is over – now back to work!!! We had such a wonderful fam trip, and I learnt and experienced so much about the Costa Rica’s nature, wildlife, outdoor activities, and you really put together a fantastic trip for me taking in the top highlights of the best routing, hotels, tours, everything…I can’t wait to tell my clients and friends that they just HAVE to go to Costa Rica!!! Our highlights included rafting on the Pacuare – so glad we did the raft out, as it was more beautiful and exciting on the way out than in! – the hot springs at Tabacon – so relaxing! – and the snorkel/kayak tour at Manuel Antonio, along with all the colorful wildlife we saw at Manuel Antonio and in Osa. We thought our favorite hotel experience was El Silencio – the suites were so luxurious, the cloud forest so pretty, and we thought the food and service there was the best on the trip – and then we got to Lapa Rios and just fell in love with the property, the surroundings, the guides and everything - what an amazing destination experience, and we have you to thank for planning it last as that was the real highlight of our trip! It took a little getting used to wake up to our natural alarm clock at 4:30am with the howler monkeys, but this morning we were so sad to wake up instead to the annoyingly loud cars and motorcycles!!! I LOVED Lapa Rios, and can’t wait to tell everyone about how special and amazing the hotel is as a magical destination experience!!! Thank you SOOOO MMMMUCCCHH Carlos for the incredibly amazing fam trip! Your team throughout was all excellent – guides, drivers, vehicles – and you really did an excellent job at planning the trip details with the routing and pacing (we wish we had an extra night at Lapa Rios…next time!) and the hotels you booked for me were all really amazing to the best! And we don’t say this about every country we travel, but we had such a great trip, that Costa Rica is definitely a country we would love to go back to. It was so much more amazing than we thought it would be, thanks to you and your amazing team! Muchisimas gracias Carlos – you are REALLY THE BEST, and I join Jessica in confirming to the office that we can confidently send our clients to you, as we know you will take extra good care of them, and they will have a great trip with you. I really look forward to working with you and sending business your way, and to have our clients experience the beauty and magic of Costa Rica with Travel Excellence! Thank you for all of the travel arrangements that you made for our family vacation in Costa Rica. Everything was wonderful and amazing! The transportation was always on time and the drivers and tour guides very professional, knowledgeable and safe. The hotel in Arenal was beautiful and the food was excellent. We enjoyed all of the tours and would recommend them all to others that travel to the Arenal area. The weather was perfect - we were lucky to see the top of Arenal several times and only had rain one afternoon! We also enjoyed Tamarindo - this was an excellent beach with lots of fun shopping and tasty restaurants. The hotel was comfortable - a few minor problems with the air conditioning and water but the hotel staff did well to help us with these issues. We thoroughly enjoyed both the snorkel sunset sail and the river trip and again would recommend these activities to anyone who visits the area. Sadly, we are back home, preparing to go back to work next week. I will soon see the family from Costa Rica that I know from my job and will have fun sharing the pictures and stories with them. I will pass along to them, and any others I know who wish to visit Costa Rica, our appreciation for the excellent service you and your company provided for us - you truly helped to make this a memorable vacation for our family. No quiero dejar pasar más tiempo, para daros las gracias por el excelente trabajo realizado por tu equipo, en especial, Dinhora, Hilda y por supuesto Marlon (Tenía todo absolutamente controlado), en todo momento han estado encima de que todo saliera perfecto, implicados al máximo y formando parte de un mismo equipo, algo que verdaderamente es de agradecer. Cómo supongo te habrán contado, el Cliente termino extraordinariamente contento, tanto con el destino, cómo con la organización, que sin duda sin vuestra ayuda no habría sido posible. Todo vuestro equipo ha estado a una grandísima altura, incluso las dos personas que me ayudaron en el Hotel Marriott con la entrega de regalos, (Anna y Julia) se que son personas en prácticas, pero estoy seguro que con vuestra formación y la gran aptitud de ellas, serán unas excelentes profesionales. Felicidades de verdad por vuestro fantástico equipo, y por supuesto cuenta con nosotros para vender vuestro destino y por supuesto, iremos de la mano, con gente como vosotros, siempre garantizaremos el mejor servicio, nos habéis facilitado enormemente la organización del viaje. Muchas gracias y Enhorabuena de nuevo por tu magnífico equipo y excelente trabajo. My wife and I have just ended an excellent tour of Costa Rica (booked via Audley Travel) and we just wanted to say thank you to the Travel Excellence team for all your hard work in arranging our tour. I have worked in the travel industry for the past 30 years and am extremely impressed by both the efficiency and courtesy of your service. the time-keeping was immaculate for the transfers and touches such as a courtesy call half-way through the trip greatly appreciated. Congratulations - and thanks to everyone who was involved in the arrangements for our holiday! You did great work on this tour. I think it was hard, but you did well. I know the group for next year will be much easier. You have good people who care about the group. Silvia, just back from the US and Costa Rica, and wanted to thank you for the Excellent service again for our holidays. Everything went off perfectly, all the picks up on time, and very proficient and agreeable drivers. Our American friends were impressed with all the plans. The holiday was perfect, and we saw a different part of CR this time, so we now know where we want to go (and stay longer) when we come back. I wanted to send a quick email to say how helpful Marco has been in Patricia’s absence. My clients Metzler & Iannotti were very discerning and made many last minute changes to their booking. Marco made the changes with efficiency and enthusiasm and ensured these very important clients’ trip ran smoothly. I wanted to let you know that we had a fabulous trip, and we owe it all to your outstanding work. Everything you booked was tremendous, we liked all the hotels, the tours were wonderful and the trip went like clockwork. Barbara and my daughter could not stop talking about how great the trip was and how much we all loved Costa Rica. If you ever need a reference, please let me know, I will be pleased to write it. Thank you again, and I hope we have the opportunity to work with you again in the future. John & Lynda Mckay, UK. I am writing to the company Travel Excellence for the most wonderful way in which our recent tour in Costa Rica was handled through Travelbag. Every driver was punctual, courteous, well informed and helpful from Henry meeting us at the airport on arrival, which is a very important point of contact when you arrive in a new destination, to Danny that took us back for our departure, and we would like to extend thanks to all staff we had contact with, each and every one was brilliant. We really had a wonderful time and enjoyed Costa Rica and have no hesitation in recommending Travel Excellence.. 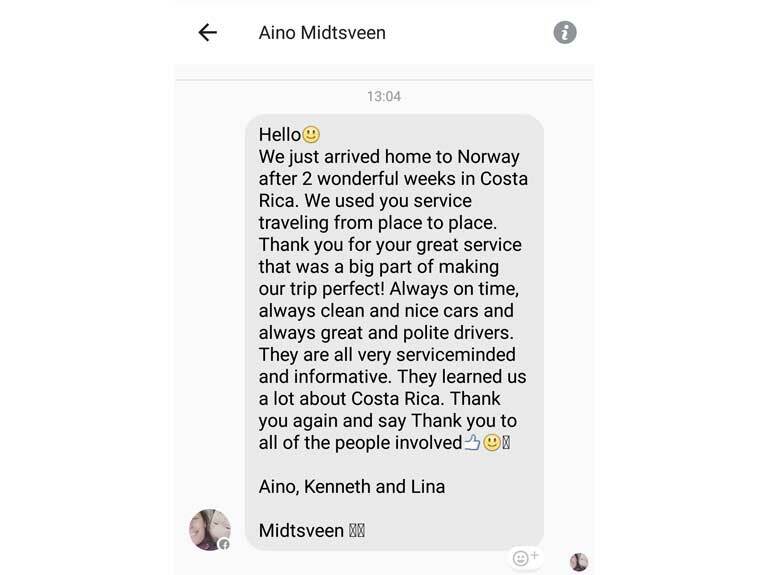 I would like to take this opportunity and thank you for the unique experience that your travel agency offered to 2 guests of our company who travelled to Costa Rica from November 26th to December 4th. Our travel agency is based in Athens, Greece (far away from Costa Rica) and although we deal very often with honeymoon couples, it has been the first time that we proposed Costa Rica as destination to a couple. Our clients returned on Monday and we had a long discussion concerning their trip. Above all, I would like to personally thank Mr. Carlos Quesada who assisted me with the organization of this difficult trip. I would like to underline that Carlos is an exceptional professional who really loves his job and this is very obvious from the way he handles his requests. He is extremely helpful, reliable and client service oriented, which is something that is not found very often in our industry. As Costa Rica has been an undiscovered destination for me, I managed along with Carlos' constant support, to organize an unforgettable trip for our clients. I am sure you can understand how important is to receive only positive comments from your clients. I feel that Carlos has strongly contributed to the success of this trip and therefore I would like to say a big THANK YOU for the professionalism of Carlos and of your travel agency. Trip was excellent. Mario and Max were a great team. Max was always safe and quick on the road unlike some other tour bus drivers we saw on the road. Mario is an excellent guide - very knowledgeable and always on top of things. He's a great guy and kept everyone entertained and even paid special attention to one of our members when she sprained her foot. We called them the costa rican M&M. Hard on the outside but sweet on the inside. The itineary worked out nicely as we did try to pack alot of activities into a short time. The pace was busy but manageable. We maximized on the fun and used the night to travel between destinations was acceptable by everyone.Sad to go home as it is 8 degrees Celsius here and raining. ITS COLD. Everyone wants to come back already and so i will be bugging you again in a few weeks. Just wanted to say a special thanks to everyone at KI and Travel Excellence for a FANTASTIC Costa Rica tour! We got back late Saturday night after an unforgettable experience. Your hard work is greatly appreciated! The hotels were excellent, the food was first-rate, the venues were great. Our students loved it. What made this tour outstanding—and eminently repeatable in a few years—was our driver Jose and our tour guide Juan Carlos. In particular, I have never had a tour guide that was so informative, so helpful and warm, and whose love of discovery was infectious. His knowledge of the flora and fauna of his country was encyclopedic, and you simply can’t fake his kind of love of learning! When we repeat this trip, we will be requesting him again! We must work on securing him with a number of high school choirs AND cross-crediting it with their respective biology teachers, because this tour was SUCH a learning experience. I may try a similar scheme with our Biology Department here when the time comes. Finally, our concert experiences were unforgettable, and it was a thrill to sing for such a worthy cause as Proyecto Daniel. Everybody won. Soy Mª Teresa Abengozar Sierra recientemente he viajado con su mayorista a su pais Costa Rica, concretamente del 5 de noviembre al 21 de noviembre de 2010, eramos un grupo de amigos de 10 personas, mi mensaje es solamente para hacerles saber lo estupendo que ha sido el viaje, somos un grupo que lleva viajando muchos años a distintos paises y puedo asegurarles que ha sido uno de los mejores viajes que hemos realizado, no solo por lo preciosa que es Costa Rica, sino tambien por lo bien que ha estado organizado y sobre todo por el magnifico trabajo que ha realizado el guia que nos ha acompañado (Allan Vargas Gomez) y el conductor del bus (Alex Villalobos), ambos son dos estupendos profesionales que han realizado su trabajo magnificamente, con amabilidad y disposición en todo momento, además de habernos transmitido el entusiasmo que sienten por su pais, quiero agradecerles que mantengan profesionales de este gran nivel y no duden que recomendaremos a todas nuestras amistades su agencia y su pais, que no solo es bonito por sus recursos naturales, sino también por la amabilidad y bondad de su gente. I just wanted to say thank you very much for arranging us such a wonderful holiday for us in Costa Rica. Everything worked out so well, including having to rearrange the rafting because of the rain in La Fortuna. Thank you also for changing the time of the transfer back to San Jose airport on Friday morning. We arrived home to the UK safely on Saturday morning. We will be recommending Costa Rica as a holiday destination to all our friends, for it's beautiful scenery, wonderful wildlife and very friendly people. We are still looking through all our photographs but the happy memories are with us already. I'm sure you don't remember me but we met a couple of times when I was working for Kuoni. I have recently returned from an escorted tour holiday to Costa Rica which I booked through Archers in the UK, with yourselves providing the ground services and just wanted to write and let you know how fantastic the experience was. The itinerary was well thought out and, while visiting the major highlights, also minimised the time spent on the coach. The hotels were of good quality, and while some could have been more centrally located I guess it is not always possible to fulfill both criteria. Staying two nights in each location allowed more time to relax as the tour itself was fairly packed. I would like to draw special attention to the efforts of tour guide Diego Velasquez who accompanied us throughout the tour and also our driver Will. Both were complete professionals throughout, being on hand to provide any assistance needed and answer a constant stream of questions as well as being able to spot wildlife which to me seemed invisible to the naked eye! Diego was the perfect tour guide, combining friendly humour and jokes with attention to detail, professionalism and excellent knowledge - traits that are not always combined in one person! Will was always on time with the transportation and was ever friendly, funny and helpful even after some long days of driving. There was a great dynamic between the two and this added to the atmosphere and humour of the tour. Once again thanks for a great holiday! First… thank you so much for you real quick replies!! They really make a huge difference in our ability to close CR bookings and I hope you stay assigned to LTD for a long time so we can continue to bring good business to Travel Excellence! Ciao a tutti, Ilaria mi ha girato la mail di Tatiana e approfitto della vostra attenzione per ringraziarvi tutti di cuore per la vostra cortesia, affidabilità e competenza dimostrata nel nostro soggiorno in Costa Rica. Scrivo in Italiano perchè so che Erica lo parla benissimo, e poi se scrivessi in spagnolo non mi capireste di sicuro perchè so scrivere solo hola; per quanto riguarda il tortuguero è stato bellissimo avete una natura fantastica e una cultura altrettanto ammirevole perchè siete tutti molto cordiali e sociali. Il mio è un giudizio fatto di emozioni sicuramente Ilaria sarà più tecnica di me, ma per concludere posso dirvi che non dimenticherò mai questo viaggio ed il Costa Rica che prima per me era solo un puntino sulla cartina mondiale invece adesso grazie a Travelexcellence occupa uno spazio enorme nel mio cuore come tutti voi!!! I would like to thank you for a very well organised tour of your country. We visited San Jose, Tortuguera, Arenal, Monteverde and Manuel Antonio and all had their own special features. All of your transport and travel arrangements worked well and to their scheduled times. All of the guides were friendly, helpful and knowledgeable. One even stopped the car and setup his telescope at the roadside so that we could view a sloth in a nearby tree! Thanks for an enjoyable holiday. I would certainly like to visit you again. Just a note to follow up and thank you for your excellent effort in finding us a perfect vacation in Costa Rica - we will never forget the fun we had interacting with the local people, the activities, excursions, the tour people, and the whole Costa Rican experience. This would not have occurred without your particular attention to details, contacting all hotels, transfers, emails, options, questions, etc.- I will certainly pass this information and your contact details to my colleagues and friends. Thank you from all the Tudors! Thank you for putting together my recent vacation package in Costa Rica. I had a fantastic experience during my visit and I really enjoyed meeting you all in the offices in San Jose. Everything went very smoothly and the service is truly “Excellent” so thank you. The car hire service was very well run and I had a lot of enjoyment exploring your beautiful country in this way. I hope you are all well and I look forward to sending more clients your way. Ya estamos de regreso en Canarias, una vez que hemos terminado nuestras vacaciones en Costa Rica, y como dice el refrán todo lo bueno: acaba y pronto. La hemos pasado genial, queremos agradecerte la atención y delicadeza que has tenido en organizarnos estas vacaciones. Nos ha gustado e impresionado todo lo visto y vivido, las excursiones, las actvidades, el alojamiento, traslados, consumisiones. En fin todo. Creo que la posibilidad de haberla pasado mejor y en identicas condiciones, hubiera sido muy dificil. Estamos muy contentos y satisfechos con la experiencia vivida. Por supuesto que ha valido la pena ir tan lejos. Gracias a todos ustedes, desde el chofer que nos recibió en el aeropuerto, a los guias de tortuguero ( Leo Jonson y Ray Brown), que nos acompañaron en Tortuguero. A ti especialemnte por haber tenido la paciencia y confianza. No nos cansamos de contemplar una y otra vez las fotos tomadas, que recogen la estancia y nos traen tantos gratos recuerdos. Desde ahora Travel Excellence podrá contar con nosotros como embajadores y portavoces en Canarias, de su esquisito servicio. Muchas Gracias y enhorabuena. PURA VIDA! We've recently booked our vacations with you and I wanted to thank you for the wonderfull work you've done! The organisation and the time was great, we've passed amasing moments everywhere and we really appreciated everything! Hotel Los Lagos and specially El Parador was amasing!!! Thanks again for your advices and I'll be glad to recommand your agency and your wonderful, green country! We certainly had a great time in Costa Rica. We enjoyed the diversity and the movement from the Caribbean side to the Pacific side. The hotels were exceptional and we would recommend Brazil come over here and take a leaf out of the Costa Rican book of style and service. Our finest time was spent at Playa Nicuesa Rain Forest. This was as close to nature that we have experienced in respect to sleeping in the rainforest. It pushes your boundaries of comfort as you shared your time with every insect, reptile and mammal. The kids were excited to find nearly all the venomous snakes in a secondary forest plus playing with dolphins and following about a 100 of them swim across the Golfo. Kayaking in Crocodile infested waters with your child in the kayak was frightening but exciting. We met some very passionate and interesting people there including Alvaro Ugalde who was director of the National Parks. We honestly thought (and now ashamed to admit) that Costa Rica would be loaded with Americans and five star sterile hotels. We could not have been so wrong. As much as most of the tourists do come from the North of this continent Costa Rica offers some exciting and adventurous places and occupied by like minded people. If there was any other ingredient we would add to your superb recipe it would be an introduction to the history and indigenous people of Costa Rica. So we applaud you for all your hard work in ensuring we enjoyed Costa Rica, as we all very much did. Hi Natalie, As you can see and have learnt from Michelle, and also from your correspondence to KIMBERLIE (my daughter) Leverage Management Consulting , our sister company which is managed by Kimberlie won the Government proposal. From the commencement of our communication and contact with Travel Excellence we had a very good feeling in working with your company – I have told Kimberlie that you are the most professional team that I contacted in Costa Rica. I would appreciate if we can continue on this trend to make the programme a successful and beneficial one for all parties involved. I look forward to a long lasting relationship with TE. We had the pleasure of visiting Costa Rica (for the first time) for an 8 night tour with Travel Excellence on March 20-28, 2010. Your company did a fine job, and we were pleased with the accommodations.. Thank you for an enjoyable trip! However, the MAIN reason for this letter to you is to commend our guide for the trip - Hector Calvo. As a business owner, I am well aware of the difficulty in finding good employees. You have struck gold with Hector! He is courteous, very knowledgeable and extremely detail oriented! He made our trip care free and added value with his extensive familiarity of the local wildlife. We felt safe and in good hands. If Hector was available for hire in California, I would employ him in a minute!! Thanks again and I do hope that you realize the gem you have in an employee as valuable as Hector. We are back in San Jose what means that our trip becomes to an end. We have got a very beautifull time in Costa Rica. Everything was perfect, no complaints at all, so I have to thank you for your arrangements. Your organisation was perfect. We have the impression that often, we have got the best placed rooms of the choosen category because it was booked by Travel Exellence. We will recommend you and Travel Excellence to our friends and everyone who wants to visit your country. Thank you very much, and best regards. Aside from that, the whole tour was excellent and very good value for money. I am a biologist and ex-university lecturer so I tend to examine guides critically. In this case they were all fantastic. I was impressed by the depth and breadth of their knowledge. Accommodation was good value and food what I had been told to expect. Everyone was friendly and helpful. We have only once return from a holiday feeling so regenerated. Dear Natalia, just a quick email to thank you so much for organizing such a successful trip to your beautiful country. The choice of hotels in such diverse areas and climates was superb. The length of stay in each was very appropriate, and we loved our few days at Tango Mar, whose owner was delightful. If only you tame the waves, too powerful for our team! Most of thank you for the excellent and friendly driver and guide. Heiner was a star, a brilliant biolgist, always charming and helpful and most discrete. One of the best guides known to me on similarly long trips. I have received much adulation and praise for the trip from. Those on itn and it is entirely thanks to you and heiner and the ever vigilant Max. I just wanted to write to let you know that we had a fantastic trip to Costa Rica. Everything was brilliantly organised and ran to plan perfectly. Many thanks to all who helped at Audley Travel and to Travel Excellence in Costa Rica (in particular Hilda) for helping organise such an unforgetable trip. All our future holidays now have a lot to live up to. Hello Natalia and Carlos, I wanted to send a big thank you to both of you for arranging the one day pass tour to Hacienda Guachipelin – it was absolutely fabulous! We went white water tubing, did the canopy canyon tour, horse back riding and went to the falls and had a wonderful time. Thank you again for arranging this and I will be sure to let all of our group planners know of the experience we had and what the Hacienda offers. Thanks again! What a fabulous vacation it was!!!! You did a great job of putting us up at super locations and organizing great day trips. I am so grateful that we did NOT drive! Travel Excellence was perfect and always on time, great drivers and super tour guides at every location. The weather was of course, rainy in Arenal, as well as Monteverde and sunny at the coast. The one day that was crystal clear in Monteverde was the day we went zip lining, very lucky!!!! We ended up up-grading to the 727 aircraft at Costa Verde since it was empty and was a two bedroom suite which worked out better for our family - totally cool! Again - Thanks for all your help in making this a very memorable vacation for our family. Please pass on our appreciation to Marcos at Travel Excellence for the very professional and well organized package he put together. Many Thanks! Hola Marco, Hablé esta mañana con los Sres. Moreno y han vuelto encantados, ha sido un viaje que les ha encantado y esto ha sido posible gracias a tu colaboración y gran trabajo que has hecho. La Suite que tuvieron finalmente en el Paradisus les gusto mucho. Marco muchisimas gracias por toda tu ayuda, es un placer trabajar con profesionales como tu, y por supuesto contamos con vosotros para cualquier futuro servicio que necesitemos en Costa Rica. Un abrazo y Feliz Año Nuevo !!!! Estimada Hilda, Muchas gracias por su pronta respuesta y ciertamente permítame señalarle que es una de las respuestas más claras y completas que he recibido; tomando en cuenta cualquier destino del mundo a los cuales consulto, y créame que son varios. Por lo que permítame con toda humildad, felicitarlos por vuestra gestión, que hace nuestra tarea mucho más sencilla. Gracias por vuestra asistencia. Cordiales saludos. PS: Please could you also pass on the following, from Lowri: I would like to specially mention both of our guides, Carlos in Tortuguero and Juan Carlos everywhere else. They were brilliant. I just came back from Costa Rica on a trip arranged by Travel Excellence. They are based in San Jose, Costa Rica and know the country extremely well. Everything that they arranged was very well done. Hotels were good, all transfers and tours were exactly what we wanted and what our clients would want. Guides were friendly, knowledgeable, and always on time. They are very easy to work with, get back to every email in a very timely manner, and their prices are very fair. They will be the only operator I will use when I sell their country. Realmente no tengo palabras para agradecerles la invitación para conocer un país tan rico y hermoso como es Costa Rica, con gente maravillosa, tan respetuosa y gentil que hace que sea aún mas recomendable para visitarla y disfrutarla !!!! He llegado ayer de viaje a la Argentina y no dejo de hablar del viaje y de los hoteles que hemos visitado, las excursiones, la amabilidad y cortesía de la gente, la gastronomía y la exuberante flora y fauna. Realmente estoy convencida que fue muy util para mi formación profesional ya que ahora puedo vender el destino con el corazón, ya que deje muchas expectativas de las agencias que nos compran para que les cuente y desde luego enviarles todas las fotos que he tomado y el material precioso que nos dieron en cada hotel. Quiero nuevamente agradecer a Travel Excellence por haber organizado el Fam y haber coordinado todas las actividades que por cierto fueron minusiosamente seleccionadas para que todos los días fueran maravillosos y provechosos para poder conocer y vender aún mejor el destino. Muchas gracias a todo el equipo de Trabajo, por su compromiso de trabajo, excelencia y la amistad que nos han brindado en todo momento. Simplemente Gracias!!! Thank you for forwarding the comments made by the clients. And I would like to say a huge thank you to you all at Travel Excellence for looking after this group so well and ensuring that everything ran smoothly and that they left with very fond memories. The clients that I have spoken to so far have spoken very highly about the service you offered and the experience they had. So please do pass on my thanks to all your team who made this trip wonderful for them. What a fabulous vacation it was!!!! You did a great job of putting us up at super locations and organizing great day trips. I am so grateful that we did NOT drive! Travel Excellence was perfect and always on time, great drivers and super tour guides at every location. The weather was of course, rainy in Arenal, as well as Monteverde and sunny at the coast. The one day that was crystal clear in Monteverde was the day we went zip lining, very lucky!!!! We ended up up-grading to the 727 aircraft at Costa Verde since it was empty and was a two bedroom suite which worked out better for our family - totally cool! Again - Thanks for all your help in making this a very memorable vacation for our family. Please pass on our appreciation to Marcos at Travel Excellence for the very professional and well organized package he put together. Our trip was great, all was perfectly timed, the hotels, the tour companies and guides were great and we have to thank you for it. We had a great adventure and for sure I will send you coordinates to all our friends. A special mention for Raphael, the guide from the Monteverde Reserve. He provided so much information about the flore, the nature, the ecosystem and we got to see the ketzall twice!… and a tarantula, and much more. I just wanted to send you all a quick note to say thank you for doing such a wonderful job with the New York Institute of Technology group. Carol Jockle has traveled with us for the past 4 years, and she said her trip to Costa Rica was the best. She was extremely impressed with your company, the guide and driver. Thank you and I look forward to working with you on future trips! I wanted to send a big thank you to both of you for arranging the one day pass tour to Hacienda Guachipelin – it was absolutely fabulous! We went white water tubing, did the canopy canyon tour, horse back riding and went to the falls and had a wonderful time. Thank you again for arranging this and I will be sure to let all of our group planners know of the experience we had and what the Hacienda offers. Just wanted to say we all arrived home safely but with extremely cold conditions. I think I should have stayed for a bit longer! Also out driver Luis Chaves was outstanding. Not only is he an excellent driver but he made all my clients happy in many other ways as well. We are choosing out dates for 2011 and will advise you as soon as we do this. Many thanks again and Happy New Year to you and yours. We want to thank you so much for the arrangements you made for our family this December. We had a fabulous trip with wonderful tour guides, prompt and friendly transfers and nice accommodations. You did pay attention to detail as did our tour guides and drivers. They stopped for pictures, explained things, had patience and most of all were polite and friendly. The first driver (from the San Jose airport) made us feel relaxed and comfortable, he really took care of us until we were checked in to the hotel. Leonardo, our guide for the Arenal hike was so knowledgeable. We never expected such wonderful service. Costa Rica put it's best foot forward to us and we loved the country side and the people. Have a wonderful New Year. Kindest regards.